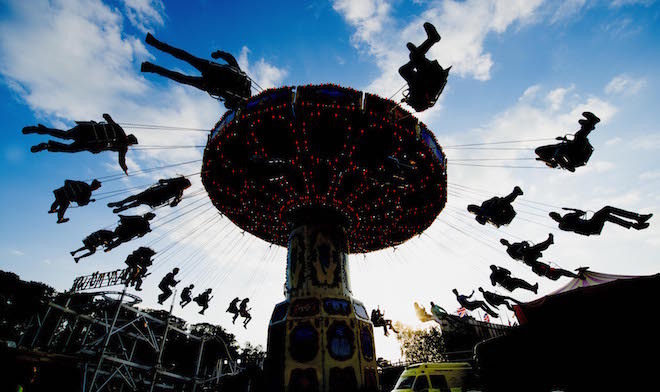 “The first weekend felt like a festival.” It’s 5 a.m. on a weekday, and British designer Wayne Hemingway (MBE)is already awake, ready to go to work on a theme park. On June 19th, the city of Margate, on England’s southeastern coast, saw its pride and joy, the Dreamland amusement park, spring back to life after being closed for more than a decade. Hemingway Design, the firm Wayne started with his wife and co-founder Gerardine, has designed the entire site, and staff have been pulling all-nighters in anticipation of the opening and continued expansion of the park. When all 16 acres are finished, the new-look Dreamland will include more than a dozen rides, a vintage roller disco, ballroom restaurants and a wooden rollercoaster built in the 1920’s known as “The Scenic.” One hundred percent of the rides have been recovered, restored or rebuilt—the rattly timber railway is being fixed under the watchful eye of preservation officials—and while the Hemingway’s designs for Dreamland reanimate a 20th century icon, they aren’t steeped in nostalgia. Signs such as “Scream if you want to go faster!” may prompt vacationers to spend a day on the midway, but Hemingway’s vision is larger than the park. He views the job of creating sherbet-colored signage and restoring rides like the Gallopers and Helter-Skelter as dead serious. Fun, in this case, can fuel an area’s revival. There are as many teenagers as there as 60-year-olds at Glastonbury, Hemingway notes, referring to the iconic British music fest that just happened earlier this month. His goal for Dreamland, beyond restoring a landmark, is to create that kind of gathering every weekend, a catalyst for the local economy. Top photo by Marc Sethi. Hemingway, whose firm is known for reinterpreting the styles of the past, was initially attracted to the project not out of nostalgia (he grew up in the seaside town of Morecambe), or the desire to work on a massive scale, but because of politics. Dreamland’s demise over the last few decades, a result of cheaper and cheaper airfare pushing British tourism from the English seaside to the beaches of Europe, emptied out the once-bustling park, a pillar of Margate’s economy. The park’s roller coaster even caught on fire in 2008. When a new owner proposed demolishing the park and turning it into housing, Margete’s population rallied together under the Save Dreamlandbanner, putting pressure on the government to stop the demolition and attracting enough support that in 2009, the Department for Culture, Media and Sport provided funds for restoration. “We have a philosophy about designing projects that matter, and this really mattered,” he says. The 1953 documentary short O Dreamland. In a way, Hemingway had to take a plot of land and an idea with a history of failure and find a new way to make it work. Budget realities complicated the challenge; land ownership issues led to insecurity during the early stages of design, casting some doubts the plan would go forward. And then when everything was agreed upon two years ago, the resurrection was given a shoestring budget. The £18 million (~$28.2M) allocated to open the entire first phase of the park, including restoring 18 rides and advertising the park, would be enough to pay for a single, decent-sized ride at Universal Studios. Upcycling and restoration was a matter of necessity. “We quite like the idea of being thrifty,” says Hemingway. “But this was probably the most challenging thing we’d done in our 36 year career. Initially, the Dreamland Trust saw the job of designer as recreating the past, evoking the ’50s heyday of Margate and the beach community so many people knew. Hemingway saw the temptation to turn Dreamland into a museum, and went a different direction. Everything, in other words, needed to be timeless. Hemingway responded with with a stylistic integration. The teacup ride has been a staple of British amusement parks, slowly spinning amusements with as much vigor and zip as a weak mug of Earl Gray. At Dreamland, the ride received a graphic update; Hemingway’s team enlisted artisans from Wedgwood, makers of classic China, to draw scenes of British street style of the side of each car. As riders spin, or wait in line to get on, they’re treated to subtle, stylized illustrations of mods, punks and ravers, bait for Instagramming youth and images that, beyond just delighting patrons, provides a conversation piece. In addition to a vibrant color palette and bold fonts, the park’s visual identity and service design could be called a refined sideshow, bright and intriguing with a wink towards social media and a respect for the past. Witty ex-punk singer John Shuttleworth recorded mocking covers of pop songs for the Counter Culture Caterpillar kid’s roller coaster, taking a page out of Pixar’s playbook by making entertainment that appeals to adults and children at the same time. Artist Tracey Emin, known for her iconic neon work, is creating a Welcome to Dreamland sign in front of the Scenic. Much of the original material initially used to build the park was repositioned, like the paint-stained, century old timber from the Scenic that was recut into seating (knickknacks made out of this wood have been big sellers in the gift shop). “The question is how do we work on different levels, where people will talk about it and take pictures?” he says. The team has even wrapped the unfinished and under-construction areas of the park in three-story high construction webbing (with proper branding), massive presents that promise a cool photo and a reason to return. The process of sifting and shuffling through styles, panning through cultural references for ideas, has always ben a part of Hemingway’s career. Never formally trained as a designer, Hemingway and Gerardine started their first venture, the clothing company Red or Dead, by buying loads of vintage clothing, collecting old pieces and learning by observations as much as osmosis. The process proved so successful for that venture, which eventually showed collections in Paris and New York and at one time had hundreds of stores worldwide, that they repeated it for graphic design. They company has an extensive archive of hand-drawn fonts and posters, which grew from castaways and advertisements they discovered in lots of old clothes. Comprising half a million pieces of work, it’s been digitized and stores on a private computer network called The Land of Lost Content. Dreamland’s opening this summer fulfills the wishes of locals looking for economic revitalization, but is grounded in the realities of cultural tourism. Up the shore, the Turner Contemporary gallery, which opened in 2011, has been an upscale draw draw, but the vision it to make Dreamland the true anchor of the area. When he was studying vintage footage and photos of the park’s previous highpoint, Hemingway was struck by how many photos showed people dancing, or having weddings on the shore, or accounts of meeting their husband or wife, holding each other’s hands for the first time during a ride on the Scenic. This is about much more than a series of rides.